Ford dealers will soon be selling the new Ford Focus estate now that full production is underway. Ford expects 15% of all Focuses sold to be estate variants. First deliveries are expected in May, with prices starting at £17,100 for the Edge 1.6-litre petrol. 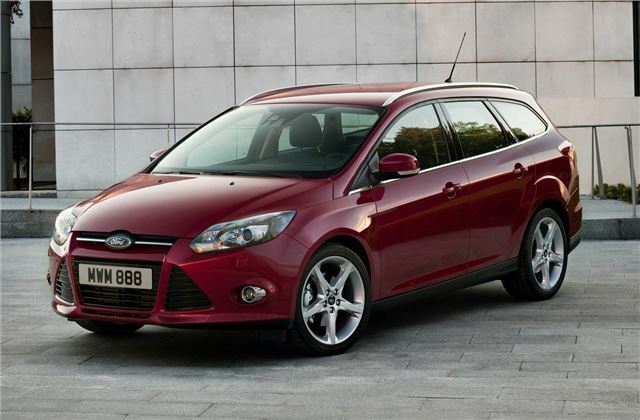 The Focus estate is longer than the standard five-door by 198mm overall, while the wheelbase remains the same. The load compartment is 476 litres with the rear seats in place, which is smaller than the previous Focus estate by 30 litres. With the seats down the load space increases to 1502 litres, which is approximately the same as the older model. The rear seats are fitted with a ‘flip fold’ mechanism to make them easier to operate and to create a flatter rear load space. The suspension layout is designed to allow a low rear floor height, as well as to allow the stowing of wider loads. The load area can be customised with a variety of options including dog guards and cargo nets. Roof racks are fitted as standard, and they form the basis of an optional cross-bar system designed for various items including skis and bicycles. Rear seatbelt warnings and power child locks make transporting children easier. A selection of both diesel and petrol engines are available, including the new 1.6-litre EcoBoost petrol with 150PS, and a 1.6 TDCI diesel with start stop, which is capable of a claimed 67.3mpg on the combined cycle and emits 109g/km of CO2, placing it in band B for VED. A host of technology is available on the estate, as in the five-door hatchback, including systems to help avoid rear end collisions, parking assistance, lane departure warning and assist, traffic sign recognition and adaptive cruise control, amongst others. “Ford dealers across Europe are seeing strong demand as they launch the new Focus range, with well over 20,000 customer orders by early April – and this figure is rising fast." said Roelant de Waard, vice president, Marketing Sales and Service, Ford of Europe. “New Ford Focus brings class-leading levels of technology, design and driving quality to the medium car market, and the estate will deliver these same qualities to an even broader group of customers,” he added.